With the price tag of less than $200, iSpring RCC7 is indeed a cost effective water filter. WQA Gold Seal Certification proves that this model is up to the quality and filtration standard. It is the BEST SELLER product in Amazon and we RECOMMEND this water filter for all usage. iSpring is a US based company that has a long history of creating reliable water filters in the market. Their specialties are reverse osmosis system. 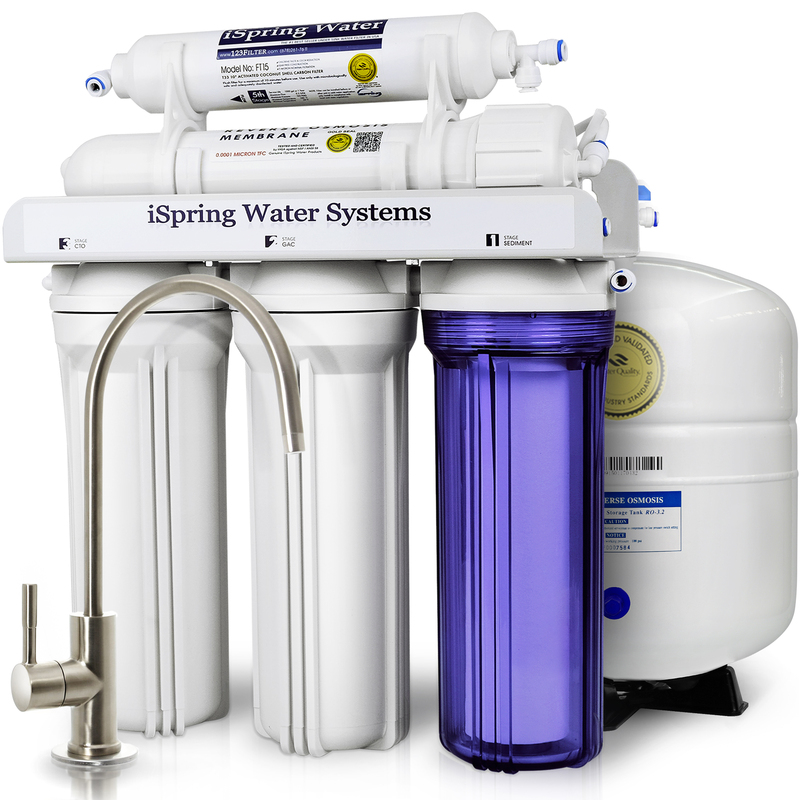 iSpring RCC7 Reverse Osmosis Filter System is one of the four Water Quality Association (WQA) Gold Seal Certified product that iSpring owns. It is an under sink 5 stages filtration system including a reverse osmosis membrane filter. Advertised by iSpring, the RCC7 is able to achieve up to 95%+ TDS (Total Dissolved Solid) rejection ratio. With the complete system, it is able to remove 98% of the chemicals, heavy materials and sediments. Below are the summarize technical specification that you SHOULD KNOW before buying the iSpring RCC7. Choose iSpring RCC1UP if pressure is lower than 45 psi. A pressure regulator is needed if water pressure exceeded 70 psi to avoid leakage due to high pressure. Capacity: 75 gallons per day based on 60 psi and 77 deg F conditions. Upgraded storage valve and new automatic shut-off valve. Stage 1: High Capacity 5 micron sediment filter – Removing dust, rust, sand and other contamination that normally can be seen by naked eye. Stage 4: 0.0001 micron Reverse Osmosis Membrane – Removing up to 95% of TDS in the water leaving a pure water behind. The heart and soul of the system. The water is stored into the tanks before it passes through the next filter. Stage 5: Post Carbon Filter – Removing taste and odor after the water left the storage tank . The table below shows the rejection rate for the most common chemicals that is dissolved in the water. Installation for iSpring RCC7 reverse osmosis system is pretty simple and straight forward. Following the user manual and the online video is sufficient to help you on the installation. There might need additional drilling for the hole of the faucet and securing the water filter system under sink. 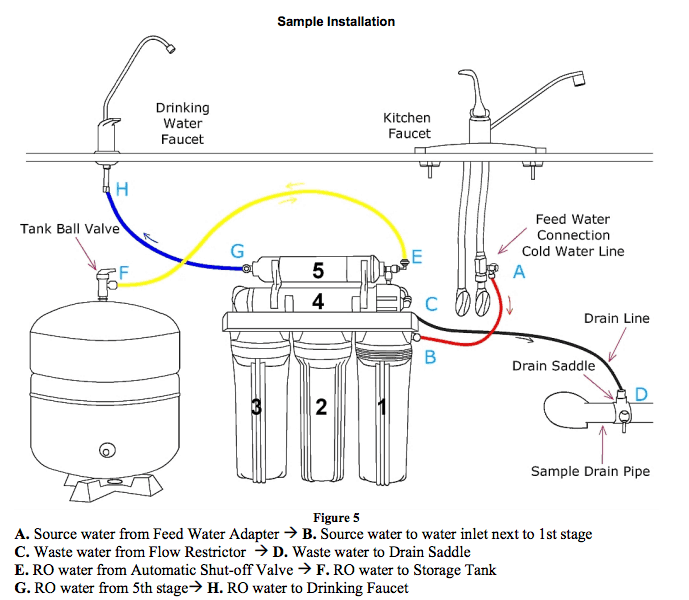 With the diagram above, it is pretty much self explanatory and easy to fix under sink. All the reverse osmosis system will need a drain pipe to channel the waste water out of the system. I would highly recommend to channel the drain line to another storage tank for other purposes such as gardening, laundry and dish washing. Those are relatively clean water as they passed though 3 stages of pre filter before rejected by the reverse osmosis membrane. It is all depends on the capacity of the water usage that you consume. You can always refer to the comprehensive troubleshooting guide in the user manual if you have any problem of the system. If the water pressure turns low, it might be a sign for you to look for a filter replacement. As the iSpring RCC7 reverse osmosis system has been reviewed and used by thousands of customer, it is good to listen to some feedbacks from them on the pros and cons. + Installation is easy and straight forward based on the manual and online video. + Apart from the drilling, no extra tools or parts needed as it is all given. + TDS is able to reduced to at least 95%. + Replacement filters are relatively cheap and it is popular in Amazon. Shouldn’t have a problem getting new replacement filters. + Provide extra parts such as O-rings, tubings and joints. + Food grade tubings are been used in the system. – Waste water is too much, 3 gallons of waste water in order to product 1 gallon of filtered water. – Whole system is used by plastic which might lead to over tighten and break the tread. – Technology from US, Not sure whether it is made from US? WQA Gold Seal Award: One of the greatest award from WQA to certified the great quality of the system. High Production Rate: The daily production rate 75GPD is among the highest as compared to the it’s competition such as the APEC ROES-50 which has a 50GPD production rate. Affordability: The system cost less than $200 with an annual maintenance fee of less than $50. It is definitely a good bargain. Find out the latest discount in our #1 recommended online store, Amazon. Great review, I usually just drink tap water and buy water bottles, which can get expensive at times. I am thinking about investing in a filter like this as I believe it will save me money, thanks for recommending this. No problem. It’s all depending on your budget. You can opt for an affordable option before upgrading to a better water filter. Feel free to visit my post on 4 Types Of Drinking Water Purifier for a different type of water purifier. I used to have a water filter in my old house back when I was living in Malaysia. It gave me a peace of mind to know that I was drinking clean water. The price for this iSpring RCC7 seems reasonable. How often does it need to be cleaned? I’m glad you used a water filter back home. The only thing that you need to clean is the sediment filter. Probably once a month. Wow, this is a very thorough review. I really appreciate all the great info. I’m looking for a good filter to use and this looks like a top candidate. Ive been using a Brita water pitcher filter and I think I can get way better filtered water while saving money in the long run if I spend a little up front. Thanks again for your help. Yes, It’s time for an upgrade. At least you are still using Brita instead of drinking straight from the tap. You will never regret getting this model! I like your comprehensive review. A good filter is something I’ve been looking out for for a long time. Honesty its because my family is not so well informed about these that is solely the reason why we still don’t have one. Anyway your review helps and I think we are one step closer. Will continue to look out for more reviews from you. Let me know if there’s more available. Glad to hear that it helps. Let me know if you need help on any other system. I am glad to answer your doubts. It’s all depends on the usage of water. If you have a huge household (More than 8) in the house, you probably need to change it every 3 months. It is not a requirement to change it on time. To check whether it is time to change, use a TDS Meter to check on the TDS. If it fells below 70% of the TDS as compare to your tap water, it is time to change the filter. That is a very thorough review of the iSpring RCC7 Reverse Osmosis System. I think that having a good and especially cost effective water filter is a must. The five stages of the filter performance are very interesting. I personally like the Post Carbon Filter since I hate it when there is an odour. Yes, especially the water condition has worsen nowadays. It is advisable to install a water filter for you and your family’s health.